CKAS Mechatronics is currently manufacturing the next generation arcade and theme park style driving simulators, with some of the most spectacular systems anywhere in the world. Our flagship model of all our entertainment simulators is our CKAS MotionSim3 F1 6DOF Motion Simulator. 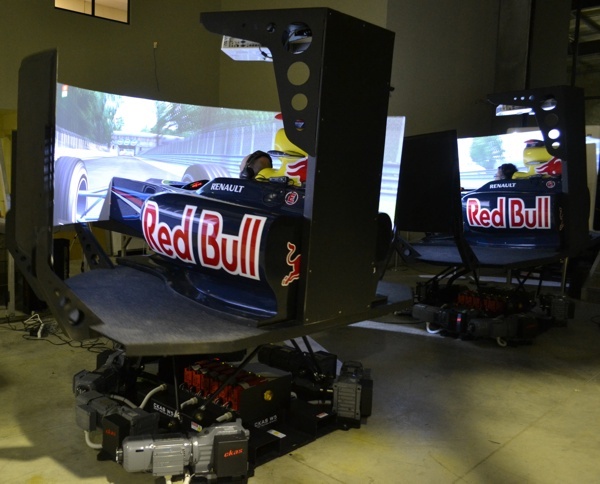 This unit is a full motion Formula 1 style simulator and is essentially a full professional Formula 1 simulator as used by several of the competing Formula 1 Teams. This simulator is for the most professional and serious entertainment applications, well suited to a specialised racing sim centre, theme park attraction or the most die hard home enthusiast. Completely immersive 180° (3 x Full HD) projector based visual system, correctly matched to show horizon and open wheel tyres in optically correct location, for unparalleled realism. After several laps in the CKAS MotionSim3 F1 6DOF Motion Simulator, the heart rate is high, the forearms are shaky, and the forehead is sweating. You are INSTANTLY punished for any mistakes around the circuit, including touching / hitting walls, ripple strips, other cars, grass, bad gear changes and the list goes on. All drivers which have had the privilege to drive this incredible Formula 1 Motion Simulator agree that is by far the most difficult – but fair – drive they have ever experienced, and the closest any person will come to a real Formula 1 vehicle. The most economical professional model of all our entertainment simulators is our CKAS MotionSim1 F1 6DOF Motion Simulator. This unit is an optimised but reduced size full motion Formula 1 style simulator and offers some incredible features. This simulator is for gaming and entertainment centres, well suited to a racing sim centres, theatre lobbies or some serious home enthusiasts. Completely immersive Full HD projector based visual system, correctly matched to show horizon and open wheel tyres in optically correct location, for unparalleled realism. After several laps in the CKAS MotionSim1 F1 6DOF Motion Simulator, the heart rate is high, the forearms are shaky, and the forehead is sweating. You are INSTANTLY punished for any mistakes around the circuit, including touching / hitting walls, ripple strips, other cars, grass, bad gear changes and the list goes on. Note: Custom units of ANY specification can be designed and built to meet specific customer requirements. Please contact us for further information.